The effects of industrialisation on Londoners and the diseases that affected them is the subject of a new ground-breaking research project being conducted by the Museum of London. 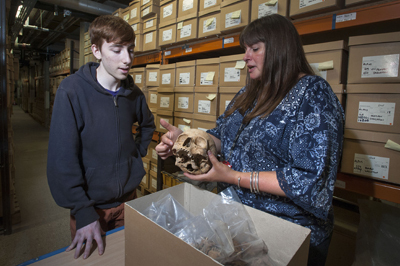 Led by Jelena Bekvalac, based at the Museum of London’s Centre for Human Bioarcheology (pictured above, right), the researchers will examine the skeletal remains of more than 1,000 adult men and women from industrial-era London, 500 skeletons from the medieval metropolis and a further 500 medieval and post-medieval skeletal human remains from areas outside of London with the latter to be used for comparison purposes. In the project, made possible through a City of London Archaeological Trust grant from a bequest made by the late Rosemary Green, the museum will employ the latest clinical techniques – including direct digital radiography, CT scanning and 3D modelling – to examine the bones. “The most tangible evidence we have for the long-term consequences of the industrialisation process upon us is, quite simply, written in our bones,” says Dr Bekvalac. The project will result in the creation of an extensive new interactive digital resource that will be able to be explored online. For more, see www.museumoflondon.org.uk. PICTURE: Courtesy of Museum of London.